If you need a detailed explantion of MRT's options, please scroll down. Plain text: creates a simple text summary in a human readable form - for e-mail, notepad, etc. 'Slash command': Changes the slash command of MRT. Please relog after changing. 'Automatically delete raids older than X days': Use with caution. If enabled, MRT will delete raids older than the configurable threshold automatically. 'Create new raid on new zone': If enabled, MRT will automatically create a new raid entry after changing raid zones. If you only want to export one raid per raid day, you might want to disable this option. 'Track WotLK raids': Enable or disable tracking of raids of the WotLK expansion. 'Use server time': If enabled, MRT will use the server time instead of local time. 'Use EPGP GP values': When enabled, MRT will try to calculate the GP value of an item and provide the value to the loot popup. This feature is experimental. 'Only track items equal or above Itemlevel X': Only track items above a certain itemlevel. Set the value to zero in order to deactivate this option. 'Ignore enchanting materials': When enabled, MRT will ignore shards, dust, etc. 'Ignore gems': When enabled, MRT will ignore gems. 'Track only first 2/5 groups': If enabled, MRT will only track the first 2/5 groups in a 10/25 player raid. 'Track offline players': If enabled, MRT will track offline players. 'Enable guild attendance check': If enabled, MRT will ask after each boss kill if you want to take guild attendance. If accepted, MRT will send a guild message, calling your guild member to whisper you with their character name. The whispered names will be added to the boss kill attendees list. 'Ask for confirmation': If enabled, MRT will ask you before sending the guild message. 'Use trigger instead of character name': If enabled, MRT will react on a configurable text message instead of guild member names. The guild attendance announcement text will change accordingly. 'Duration of taking attendance': Set the duration of the guild attendance check. While taking guild attendance, MRT will post a reminder each minute. 'Use custom guild attendance text': When enabled, you can provide a custom text that MRT will post when doing an attendance check. Variables are available for boss name, remaining time and trigger command. 'Export zone names and boss names in english': If enabled, MRT will try to export zone and boss names in english instead of the localized versions of your WoW-Client. 'Ignore per boss attendance': If enabled, MRT will ignore the per boss based data when exporting. Each attendee will be exported as if he/she attended all boss events. If you only create one raid entry for each raid in your EQDKP(-Plus) and make corrections to raid members manually, you might want to activate this option. 'Enable attendance fix for the EQdkp-Plus Raid-Log-Import 0.5.6.3': This option changes the export of timestamps a bit to pass the 50% attendance threshold of the Raid-Log-Importer. Only use this option, if your DKP system is based on per boss attendance. 'Enable boss encounter detection fix for the EQdkp(-Plus) CT_RaidTrackerImport 1.16.x': This option changes the loot export a bit to fix the boss encounter detection of the CT_RaidTrackerImport. Use this, if you have boss events in your raid without loot associated to it. (e.g. attendance checks). 'Set format of date and time': You can change the date-format of the text based data exports here. Essentially, whatever you enter here, will be in front of the first line of the export. Check the ingame tooltip for more information. EQDKP CTRT-Import-Plugin: If you run a raid composition which change at each boss kill and want to have automatic boss splitting, you will need to assign boss names (as listed in the MRT raid log) as raid note triggers and the instance name as event trigger. You can find an example at my Website in the file section. Thanks for the reminder. I totally forgot to upload the update. It is fixed in v0.81.3 and should be available for download here on CurseForge within the next couple of hours. Any plans or ways to track loot by pm chat, or rw or rclootcouncil. Its rly annoying that all ppl have to stay near boss until loot is awarded. Raid not auto-detecting, had to add it manually. Boss death detection not working. Not sure about loot as being unable to add a boss means I can't add loot. There anything I can post to help you with updating the addon? 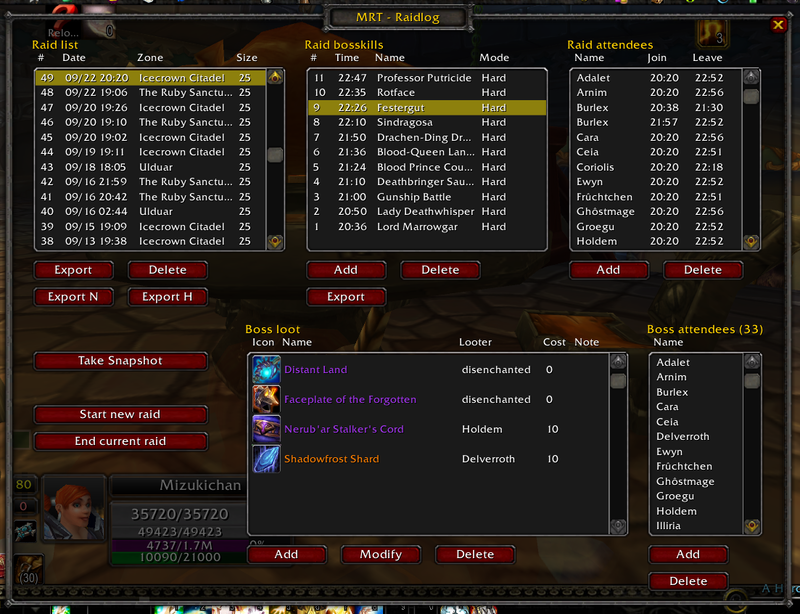 I used it religiously since MoP launched, so happy to give you as much feedback as necessary. The change is now in v0.26-Beta. That should fix your problem. It is untested, because I don't have your SavedVariables to test it with. So, any feedback would be appriciated. I've been a big fan of the addon for a long time, however now it's borking out and giving me an error message. Can't even open it, so for the time being, I'm using Raid Tracker (not my favorite). wow thanks for the speedy reply! i thought it hadnt worked as i copied and pasted the whole thing and just got errors, then noticed there were 2 scripts! Maybe this could be something to add to a future release. After that, the raid log should be back on your screen. Edit: Added missing line break. i don't know if you can help me but it seems i may have manage to move the raid tracker window outside the viewing area as it's no longer coming up. Bug found. Will be fixed in v0.25-2 Beta. Ok, I'll try to reproduce this problem. Having the join/leave-events outside of the attendance checks is not intended. You can reach me via IRC in #wowace@Freenode or #curseforge@Freenode or in IRCnet or Quakenet. My nickname there is ShadniX. I'm normally idling around there 24/7. If I'm afk, I'll answer any querys as soon as I'm back on keyboard. Well, I had that option turned on, so I went on to check what you said (even though I already tested it, just to be sure). In this case I have an "Attendance Check" boss event in which I have some (3+) players who whispered me instead of being in the raid. When I export that boss event alone (using the "Export" button in the second pane) I get the XML data. So, I paste this XML data into an editor and auto-TiDy it up (to make it readable) and look for this "boss attendees" you're talking about. There's nothing. There's just boss name (Attendance Check) and then join and leave events for each player. Of course, players who whispered me have join and leave events OUTSIDE the Attendance Check time. This, as I said in the previous post, means that the attendance check was not correctly exported. What I mean is that this is not a problem with the importer, because the XML itself is missing the data. I don't want to paste my information here, as it is public. If you want, we can discuss this further on IRC, MSN, gTalk, you name it. Edit: After playing around with the different export formats, it seems this only happens with the "EQdkp-Plus XML" option. All other options (as far as I know) are exporting attendance checks correctly. MRT does export people which were added by attendance checks. Yes, people added via an attendance check are only added to the boss attendees list. This was a design decision in order to differentiate people who were actually in the raid itself and which were added by other means. However, this does not impact the export, because all export function take both (raid attendees and boss attendees) into account. There is a little problem with the Raid-Log-Importer of the EQDKP-Plus, because it has its own view of when someone is a raid attendee and when not. But you can circumvent this restriction by activating the corresponding export option in MRT. So, please activate the checkbox for the 'Enable attendance fix for the EQdkp-Plus Raid-Log-Import 0.5.6.3'-option in the MRT export options and try again. Attendance checks are not exported correctly. I can't see their use if they cannot be exported. When I create a new attendance check (outside of boss), this addon will of course create a new boss event and all, but people who whisper me (who aren't in raid atm) aren't added correctly. I mean, they're added to the boss event, but not to the raid. So, later on, when I export this to my EQDKP Plus, it won't give them credit because they weren't in the raid at that exact moment. An easy way to fix this would be to add every whispering player to the raid with jointime = start of attendance check and leavetime = expiration of timer (3 mins is the default). I've removed LibChatHandler-1.0 and added the same filter functionality with ChatFrame_AddMessageEventFilter(). The result should still be compatible with WIM (at least a short test led to a positive result). Changes will be in the next alpha. Just a note that you definitely do not need to add any libraries to your addon to support WIM. Please visit their forums at WIM Addon Compatibility and seek some assistance. It will save you alot of work down the road, WIM exposes an API and Pazza (or another from the team) or Sylvanaar (author of Prat) will try to help with anything you need that there's not an obvious way to do. Most likely not, because the WoW-API for handling raids is a complete different one than handling groups or single persons. Thus this would require a lot of extra status checks, additional API-Calls. The change from a group to a raid could mess things up aswell. However, the current alpha has a set of GUI-buttons for starting and ending a raid manually. You will still need to be in a raid group for using these functions, but a two person raid group will be enough. Hope, that will help testing stuff. Please add an option to create a raid no matter if you are in a raid group or not. Especially for testing etc this would be very useful. A first version of a plain text export and of a BBCode formatted export is implemented in v0.15-Beta.